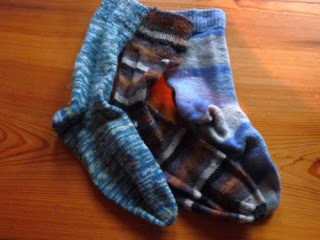 My new life in Burgenland: Put A Sock In It. Old fashioned hand knitted socks are making a comeback. I don't know about you, but when I was young those hand knitted apparels used to be a staple under the Christmas tree. Not what one wants to get at that age never mind having to wear them outside of one's house. Socks are purveyors of comfort, contentment and fun. Hand knitted ones that is. Once you've tried them, the doors to commercial rayon socks are barred for life. A woolen sock is fantastic for keeping toes warm during winter, and believe it or not, it can be a nice ice breaker, especially in our neck of the woods. Visiting people in their marble palaces means one has to take shoes off at the door. No if when or but...often I wonder if the housewives have had enough of beige high polish floors and are yearning for sturdy, robust wooden floors. Floors where shoes are welcome, and mops optional. Whenever I go out visiting I make sure to have a pair of my knitted sock stash on my feet. A friend of my parents loves to knit and likes to give away these socks. Don't tell Bob but I've been keeping theses socks in a separate drawer because his socks never last as long as mine. Once or twice I've knitted my own socks but truthfully, they are still hanging on the needles as I haven't quite worked out how to do the ankle.